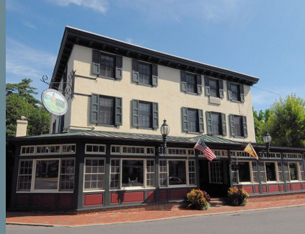 Chef Pete Gialias is the owner of the Logan Inn located in the village of New Hope in Bucks County, Pennsylvania, which opened as a tavern in 1722 and as an inn in 1727. He shares a delicious taste of the historic property with his classic Greek recipes for Lemon Olive Oil Sauce and Moussaka. 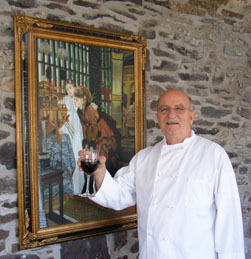 Having grown up in Europe, Chef Pete Gialias has always appreciated and has been attracted to upscale restaurants and historic properties; in addition to the Logan Inn which he purchased and opened on April 2, 2007, he also owns The Clinton House Restaurant & Bakery, circa 1743, located in Clinton, New Jersey. Although maintaining these properties require a lot of work, he feels that he is preserving a part of history. I met with Chef Pete Gialias at the Logan Inn in April 2010, where we sat on an enclosed verandah where a roughhewn stonewall was a gentle reminder of the age of the building, which is the oldest building in New Hope, and has the distinguished recognition as being the oldest continuously run inn in Bucks County and is one of the five oldest continuously run inns in the United States. Growing up in Greece, he shared how his mother would plan the menu and then go to the store daily to shop for what she needed to prepare for the meal. His approach to cooking at the restaurant is very similar to his mother's approach, everything is fresh; nothing is frozen with the exception of lobster tails and shrimp. He explained that Greeks like to cook seafood simply to allow the fresh taste to come through and then finish it with a lemon sauce. Chef Pete Gialias' lemon sauce uses a mixture of olive oil and vegetable oil because if only olive oil was used with the lemon juice and it was refrigerated, it would curdle the olive oil. This version is a very tasty and easy to make versatile sauce. Method: In a large bowl, dissolve a little salt in the water stirring constantly. Add the lemon juice, and then keep pouring a mixture of the olive oil and the vegetable oil until the mixture thickens. Serve with seafood. When it comes to classic Greek recipes, Moussaka is at the top of the list, which is a nice everyday dish. Chef Pete Gialias explained that Greek food is always involved, and while relatively inexpensive, except for the seafood, it is always labor intensive. In Greece they simply flour the eggplant and fry it, however he uses an egg wash with milk before flouring the eggplant to stabilize the eggplant and to take out the bitterness, and then fries the eggplant. Method: Make a meat sauce with equal portions of lamb, pork, and beef. He uses a mixture of the meat as it has more flavor and the aromas are better. To make the sauce, use tomatoes, garlic, onions, a little sugar, oregano, bay leaves, and salt and pepper. Pulverize, and fry everything together. Method for the Eggplant: Clean and slice eggplant, make an egg wash with milk, dip eggplant in the wash and then dip into flour, and fry until golden. Chef's Note: The secret to Moussaka is the sauce, and consistency is the key. If the sauce is too thin or thick, the recipe will not work out. Method for the Béchamel Sauce: Scald milk and add flour, salt, pepper and a dash of nutmeg stirring constantly until smooth. Remove from heat and beat in eggs. Mixture should be able to stand on own however it should not be thick like a bread dough. If the mixture is too thick, thin it with a little milk. Method for layering the Moussaka: In a baking dish, layer the sauce with the eggplant, and finish with a layer of béchamel sauce. Bake in the oven at 350° F - 375° F (177° C - 191° C), depending on your oven, for approximately 1 hour. Watch to ensure that the sauce turns golden, but does not burn. 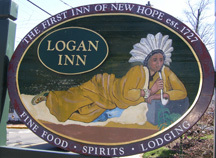 The Logan Inn is open for Lunch Sunday through Monday from 11:00 am until 4:00 pm, for Dinner Sunday through Thursday from 5:00 pm until 9:00 pm, and Friday and Saturday from 5:00 pm until 10:00 pm; and for Brunch on Saturday and Sunday from 9:00 am until 1:00 pm. There is live music in the evening, check their website for the schedule. 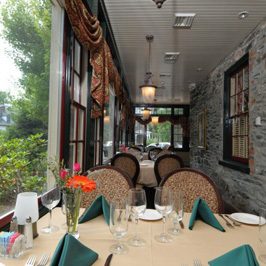 Read about the Logan Inn in the Restaurants section.